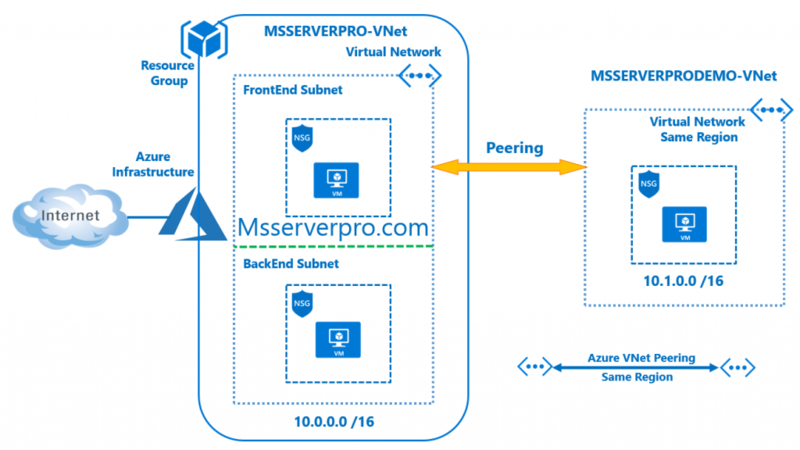 VNet peering is a mechanism that connects Azure networks (VNets) within the same Azure region through Azure backbone network. Once peered, virtual networks will work as a single network and resources can be accessed from both VNets via private IP addresses. VNet peering routes packets between virtual networks through the internal Azure backbone network. So VNet has not require Azure gateway between these networks. 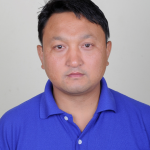 This allows a low-latency, high-bandwidth connection via virtual network peering. To configure VNet peering we need at least two Virtual network in the same Azure region. In my previous Azure article, we have created virtual network and subnets in the Azure portal. Now, we need to create one more virtual network to configure VNet peering. So we start from creating Virtual network. 1.In the Hub menu on the left side of the portal page, click New. 2. On the New blade, click Networking. On the Networking blade, click Virtual Network. 4. With the virtual network created, in the Azure portal, click All resources to Virtual networks. 1. 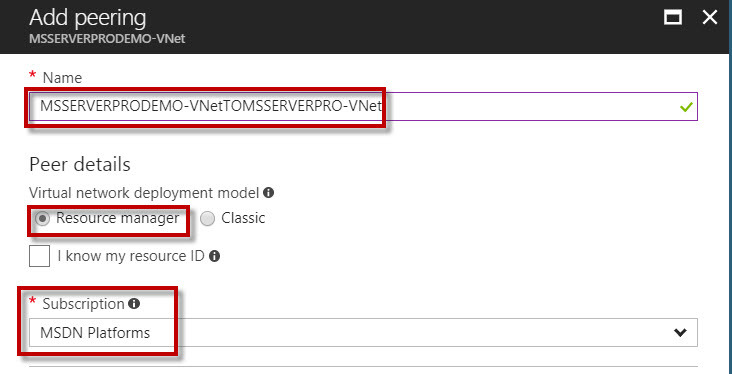 On the dashboard of the Azure portal, click MSSERVEPRO-VNet. 2. On the MSSERVERPRO-VNet blade, click Peerings, then Click + Add. 3. On the Add peering blade, give a peering link in the Name text box, type MSSERVERPRO-VNetTO MSSERVERPRODEMO-VNet. Ensure that the Virtual network deployment model is set to Resource manager. 4. Ensure that Subscription is set to the Azure subscription you intend to use. 5. Click Choose a virtual network. On the Choose virtual network blade, click MSSERVERPRODEMO-VNet. 6. Ensure that Allow virtual network access is set to Enabled. Leave remaining settings Allow forwarded traffic, Allow gateway transit, and Use remote gateways with their default values (disabled). Click OK.
8. 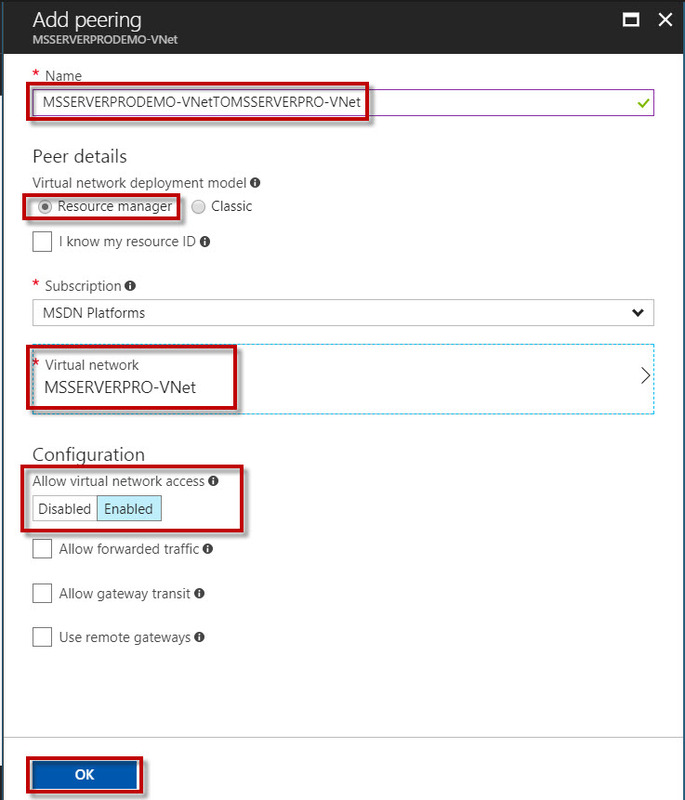 Close the MSSERVERPRO-VNet-Peerings Virtual network. 9. 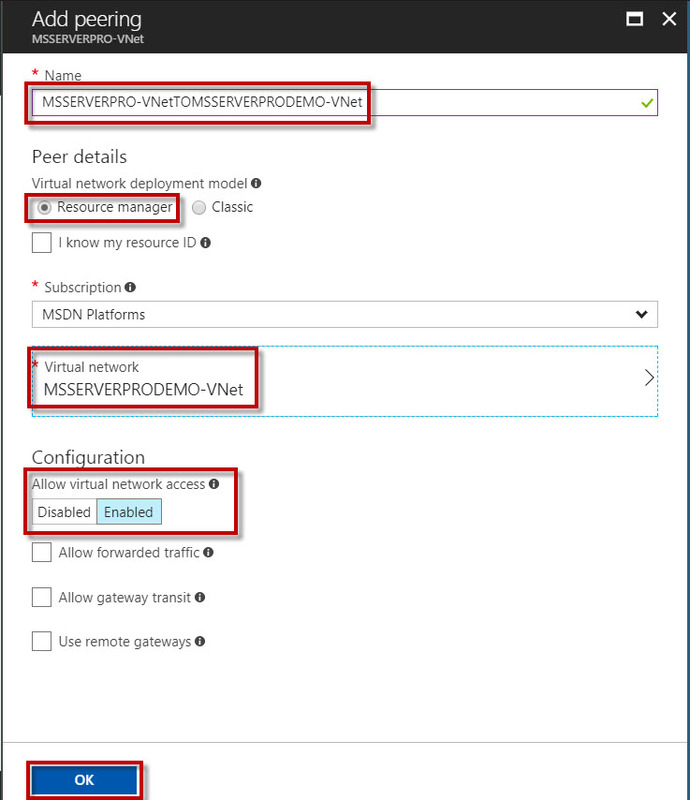 Next create the VNet peering link for MSSERVERPRODEMO-VNet to MSSERVERPRO-VNet. 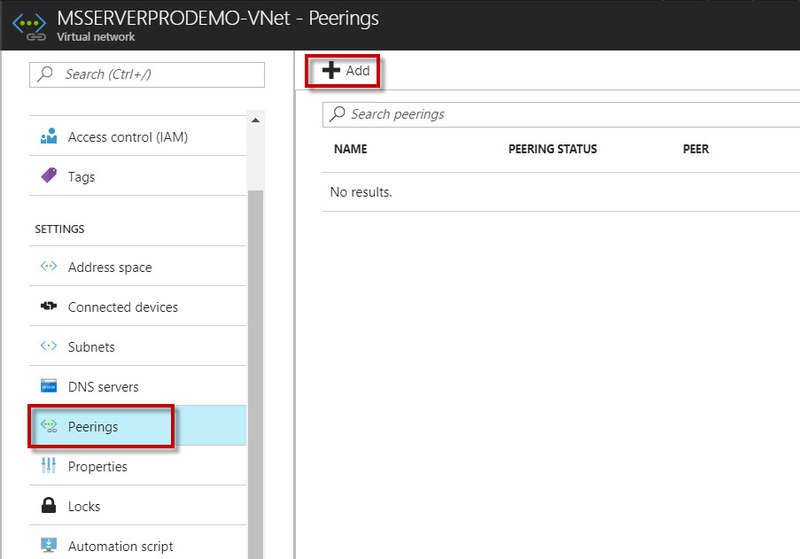 On the dashboard of the Azure portal, click MSSERVERPRODEMO-VNet. 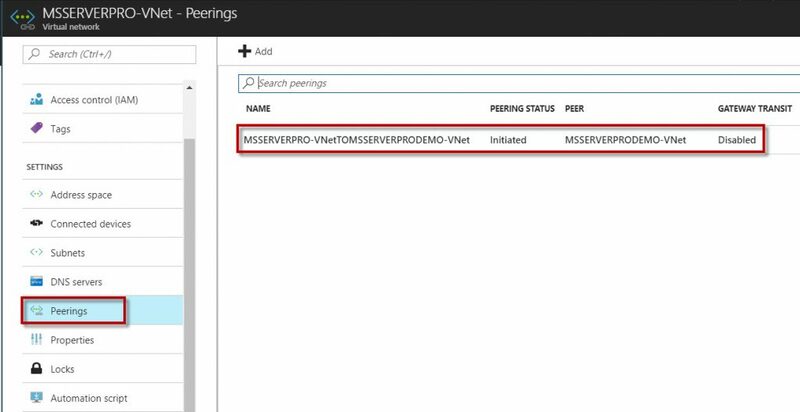 On the MSSERVERPRODEMO-VNet blade, click Peerings. Click on + Add. 10. On the Add peering blade, give a peering link name in the Name text box, type MSSERVERPRODEMO-VNet to MSSERVERPRO-VNet. Ensure that the Virtual network deployment model is set to Resource manager. Ensure that Subscription is set to the Azure subscription you intend to use. 11. Click Choose a virtual network. On the Choose virtual network blade, click MSSERVERPRO-VNet. 12. Ensure that Allow virtual network access is set to Enabled. Leave remaining settings Allow forwarded traffic, Allow gateway transit, and Use remote gateways with their default values (disabled). Click OK.
13. Once completed this VNet peering link is created, you can see the status of VNet peering updated to “Connected”. 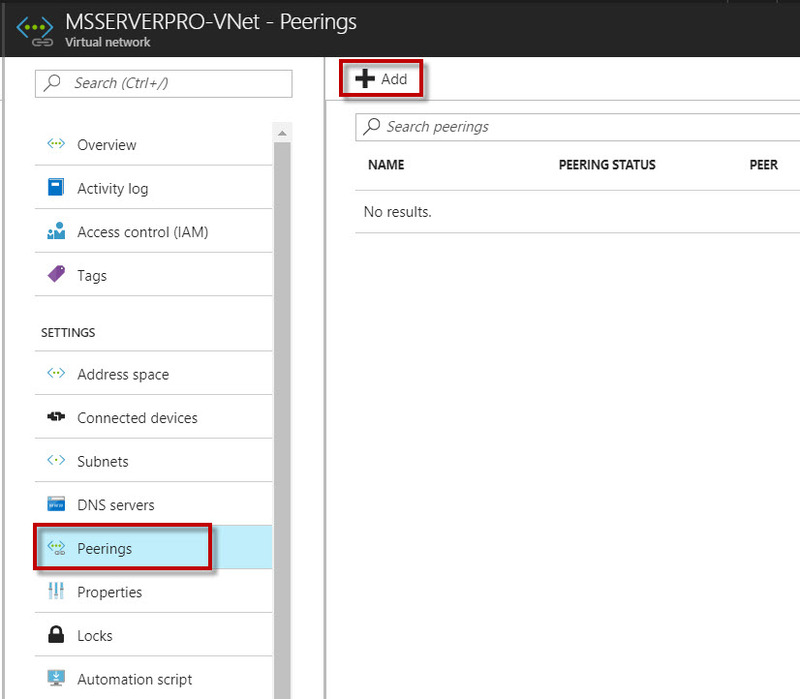 Azure VNet peering is one of the great feature of Azure Virtual network connectivity. VNet peering, which connects Azure virtual networks within the same Azure region through Azure backbone network. I hope this article help.